By Daniel Horowitz—It’s hard to believe, but UJA’s annual Walk with Israel is just around the corner! 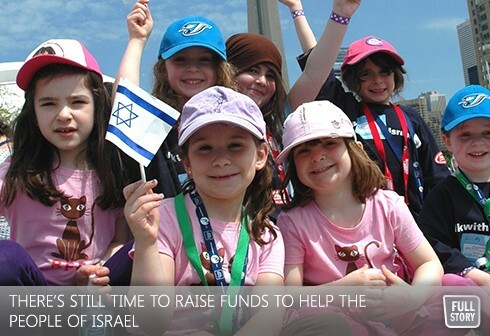 Fortunately, if you haven’t done so already, there’s still time for you to register your fundraising team and take either the $1,000 or $5,000 Walk with Israel Challenge and earn amazing rewards for you and your team, including theatre tickets to Mirvish Production's Les Misérables, family memberships to the Toronto Zoo and Ontario Science Centre, seasons passes to Canada’s Wonderland, Apple Store & Best Buy gift cards and more! And, by signing up for the Walk now, you’ll be pre-registered to receive your event lanyards, Walk with Israel t-shirts, ride passes to the Renee & Irwin Nadal Festival and meal deals for the Mizrahi Design Build Kosher BBQ! Each year, an estimated 12,000 to 15,000 Torontonians come together for this community staple and the largest single-day Israel solidarity walk in the Diaspora, taking place on Sunday, May 26th – rain or shine – starting at 9am at Coronation Park. To take part and help raise money for UJA’s vital ongoing projects in Israel, visit walkwithisrael.com/register and set up your personal support page. Be sure to send an invitation to your friends and co-workers who can sponsor you online. The Walk offers all participants a fun and exciting experience filled with great music, kosher food, entertainment, activities for kids, and much more. Being Toronto and all, make sure to check the weather forecast and prepare appropriately. You may need an umbrella, raincoat, sunscreen, extra sweater, walking shoes, water/snacks (though this will be available at our various rest stops) and of course, Canadian and Israeli flags to show your pride! Unfortunately no pets or bikes will be allowed on the Walk.